Generate tasks based on automatic workflows (cadences) or manually create/assign tasks to your team. Tasks are created from Cadences. As you create a Cadence, each step is being recorded in the the To-Do List. As you create Steps within a Cadence, you will see them appear in the list to the left. Once the Cadence is saved, these Steps automatically become Tasks, which will appear in the Overall To-Do List as well as the individual Customer's To-Do List. Cadence steps that are setup to go out automatically will have a status of "Scheduled" meaning they are scheduled to go out on the scheduled day, during the next available delivery window. Cadence Steps that are not scheduled to be sent automatically will have a status of "Pending" and will not be sent until manually approved. Tasks that were unable to be sent will will have a "Failed" status, hovering your mouse over the "failed" icon will display the reason for the failure. Select the To-Do List icon in the left sidebar. Filter the tasks by clicking the icon in the top right corner. If an Action is Pending, you can select the three dots beneath Action and mark it as Complete. To create a New Task, select New Task in the top right hand corner of your To-Do List. Give it a description of what must happen, a desired date of completion, and then assign it a Customer and the name of the User that needs to complete it. 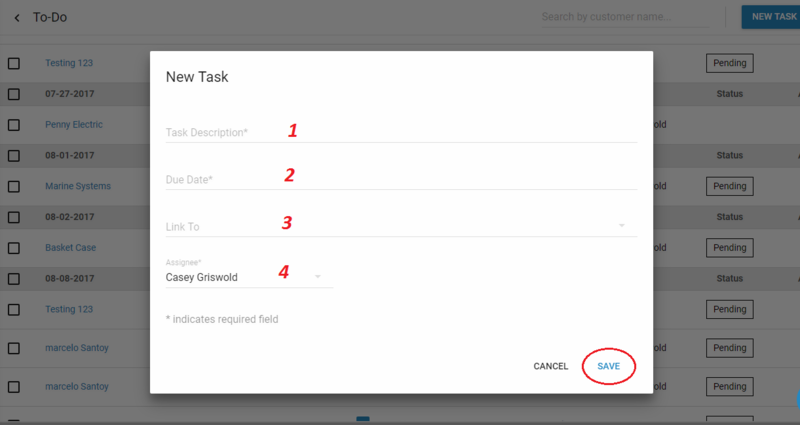 You can also create a New Task for a Customer within their Customer page. By selecting the To-Do tab, you will see all the assigned tasks for this particular Customer.